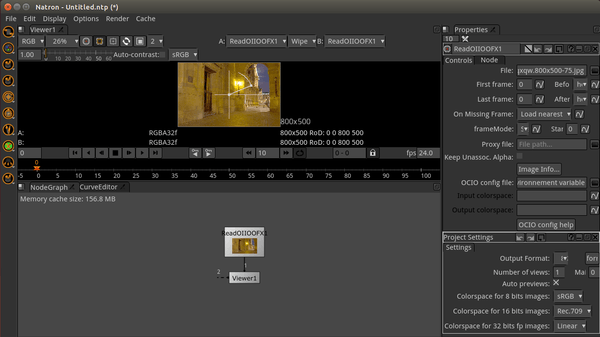 Natron is a free and open source video compositing software, similar in functionality to Adobe After Effects or Nuke by The Foundry. 32 bits floating point linear colour processing pipeline. Colorspace management handled by the famous open-source OpenColorIO library. Dozens of file formats supported: EXR, DPX,TIFF, JPG, PNG…thanks to OpenImageIO. Recover easily from bugs: Natron sometimes crashes. Project format written in XML and easily editable by human. Low hardware requirements: All you need is an x86 64 bits or 32 bits processor, at least 3 GB of RAM and a graphic card that supports OpenGL 2.0 or OpenGL 1.5 with some extensions. Command line tool for execution of project files. Multi-view workflow: Natron saves time by keeping all the views in the same stream. So far, the Linux binaries are only available for 64-bit OS. 2. Extract the downloaded package in your file browser. The Install.sh script will automatically install Natron into /opt/, create a launcher icon and symbolic link to the executable. So that you can launch the software from Unity Dash or by running Natron in terminal.